HYDRATIGHT, which began as a relatively small engineering company in the UK over 30 years ago, has over the past decade grown into an award-winning, globally-based, leading authority on the subject of bolted joint integrity. Towards the end of the 20th century, the company had embarked on a major effort to ensure its experience would be useful in shaping the future standards of engineering and training applicable to its core activities, bolting and specialist machining. Several of the company’s engineers have since helped to formulate many of the standards by which modern bolting is undertaken. At the same time, company designers were developing a range of tools that would be key in offering the accuracy and reliability also demanded of professional technicians – a range now in use all over the world. In the course of expansion and takeover of smaller European companies, Hydratight itself came under the wing of Actuant, the diversified engineering conglomerate, and has grown to encompass subsidiaries of its own in machining and machine tools, boring, nuclear plant maintenance and associated fields. The company now designs and manufactures world-class torque and tension equipment and in-situ machining tools, offers specialist bolting, machining and design services, trains technicians to certified standards, develops joint-management software, undertakes nuclear plant maintenance work and more, including working with operators and asset owners to develop their joint integrity management procedures and helping to reduce leaks. The company’s most recent collaboration has been with a major UK diving company, to offer highly detailed theoretical and – uniquely – practical subsea bolting training to professional divers. Thus in the handful of years since acquisition, Hydratight has become a global business in its own right, with over 1,300 employees – mostly highly-trained technicians – operating from over 30 facilities strategically located across the continents, including Saudi Arabia, the UAE, Kuwait, Oman, and Qatar. The regional headquarters is in Dubai. The Middle East is a key region for the company for obvious reasons: many of the world’s biggest oil and gas businesses operate here and Hydratight is a first-choice supplier of products and on-site services including pipeline repair products such as the Morgrip weldless connector, extensively used across the world. The company has several “frame” agreements with major operators, guaranteeing them essential products and services on an on-call basis. A recent development of this idea has been the Emergency Pipeline Repair Service, run on a membership basis, which guarantees members the fastest possible turnaround of the equipment and manpower needed to complete an emergency repair, minimising production losses. Hydratight’s widespread facilities are linked by one global database, which allows each facility to act both alone and as part of the wider company, drawing in resources from any centre. This can bring about the sort of interactivity that would have been impossible even a decade ago. As a recent example, three separate centres – UAE, Saudi Arabia and the UK – recently collaborated on a project for a client in the Arabian Gulf. The client contacted the UAE office about subsea bolting and flange-pulling equipment, but didn’t offer enough detail for a quotation. 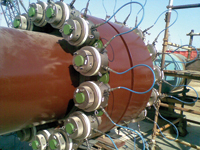 The Saudi Arabian office contacted the client’s engineers and carried out a full technical survey, eventually realising the order would require the manufacture of several non-standard subsea tensioners. Engineers in the UK worked up the designs and collaborated with the company responsible for the flange supply to ensure a perfect solution. The investigation, designs and quotation were completed within a week, an order agreed and the tools delivered a few weeks later – including a late extra order, handled by the Saudi Arabian office, for a calibration kit and training to operate it. “Though each centre offers services individually, we are a global company and also act as one big team,” says PCA Mohan, Hydratight’s regional managing director.